Joe Mills is a full-time elementary art teacher and part-time freelance illustrator who specializes in Chicago themed illustrations. I am a full-time elementary art teacher and part-time freelance illustrator. 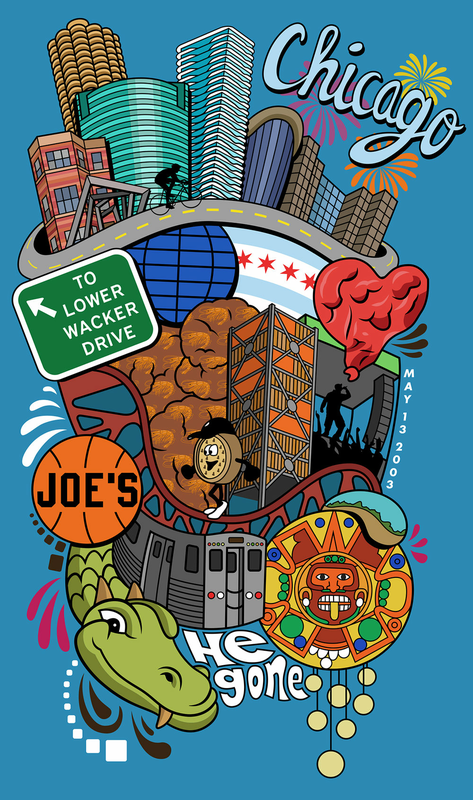 I specialize in Chicago themed illustrations. What started out as a way to pay homage to my home after a move to Australia has turned into a mild obsession to find as many unique and creative ways to illustrate the City of Chicago. My other specialties include typography and calligrams. A calligram is a word or piece of text in which the design and layout of the letters create a visual image related to the meaning of the words themselves. For an example, see this example from my portfolio. While I do have specific strengths, I am open to any number of illustration and design opportunities. I have over 15 years of experience using Adobe Illustrator. Please be sure to look at my full portfolio. If you are interested in illustration or design work, please contact me for a quote. Each illustration is priced depending on the size and scope of each project. You can email me directly at joemills1(at)gmail.com. Paperish Mess – 1945 W. Chicago Ave.
Chicago Magpie – 6443 N. Sheridan Rd. Galerie F – 2415 N. Milwaukee Ave.
Prints in custom sizes and colors can be ordered through Colbert Custom Framing & Printing. They are located at 1283 South Naper Blvd. in Naperville.